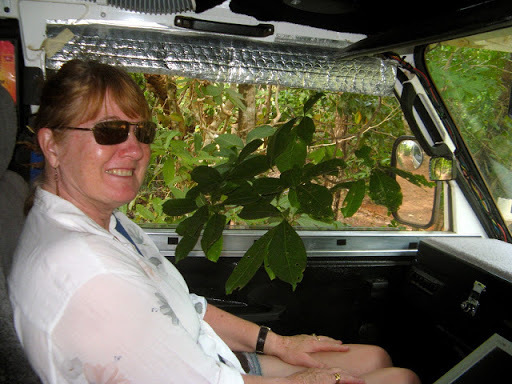 We spent a day in Mareeba shopping and stocking up for the next long leg of the journey north. 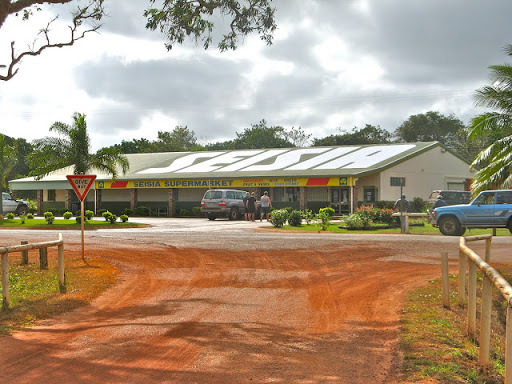 Mareeba is a great place to shop, it's close to Cairns but up on the tablelands where it's not so hot or humid. It has an extensive range of shops and more importantly it is well served with service and spare parts outlets. 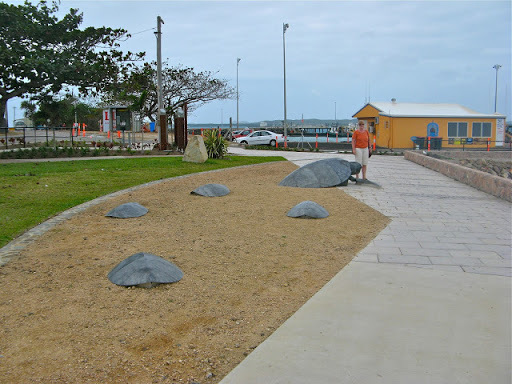 There is almost nothing that can't be done or got in Mareeba and all with a surprising degree of friendliness that you don't get in big cities. 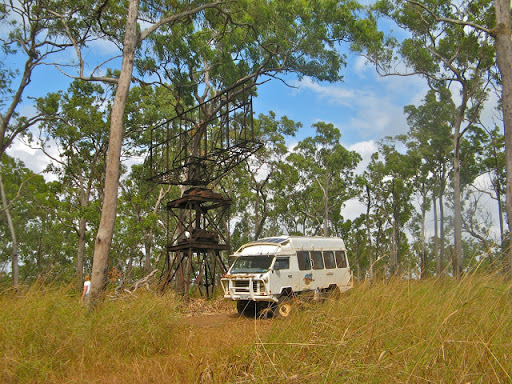 There are also some good scenic areas around Mareeba, such as Granite Gorge and the Beck war machines Museum. We had 3 maintenance days at a free camping area in Mt Molloy, just north of Mareeba, where I greased everything and fixed a few annoying problems, like some burnt out alternator wiring which stopped it charging, stopped the tacho working and caused the ignition light to be on all the time. 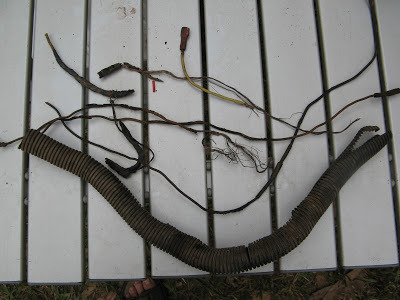 Remains of the burnt out alternator wiring. Coincidentally, the solar panel charge controller also failed. The series power MOSFET had failed, maybe due to overheating. I didn't have a spare so I rigged up an alternate circuit using a common or garden automative relay which I switched on using some transistors, driven from the voltage sensing circuit which was still working. After a couple of months it is still working fine. There's just never a Jaycar shop around when you need one. 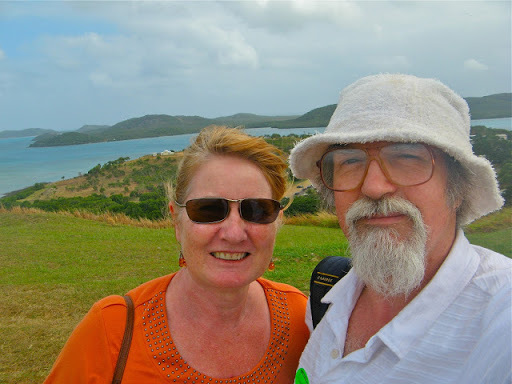 From Mt Molloy we started the Cape York track proper. There are no end of road houses along the track to the turn off for Weipa but the road is pretty ordinary, it starts bitumen but slowing becomes rough and corrugated gravel. 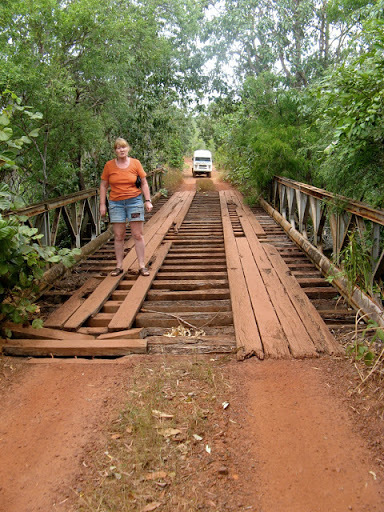 We assumed that this was the good bit for traffic to Weipa and the tourist track to the Tip would be worse. However we were wrong. We called this one "Charles". 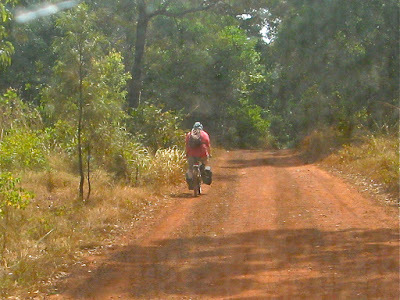 After leaving the Weipa road, the track was narrow but smooth. It was reasonable most of the 300 km to the Jardine River crossing except for a hundred km or so of corrugations and rough gravel near the river. We chose to take the bypass roads rather than risk the Overland Telegraph Track which is strictly testosterone fuelled 4WD territory. Why take a very serious risks at many of the creek crossings if you don't have to? 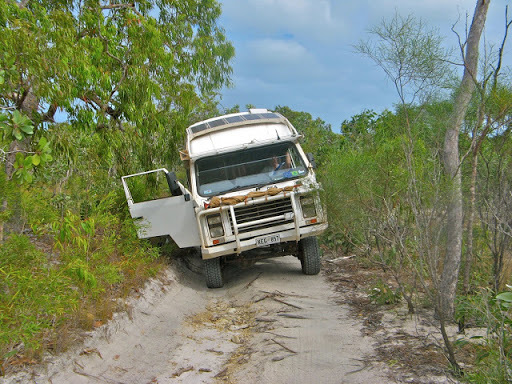 Smashed up front ends, bogged vehicles and burnt out clutches and winches are common stories. And in any case there were so many people around that it didn't even seem remote, although it is if you look at the map. 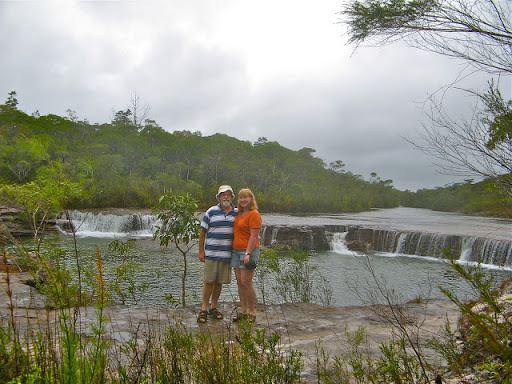 We stayed at the Hann River and Archer River Roadhouses on the way up and the Moreton Telegraph Station and Musgrave Station on the way back. 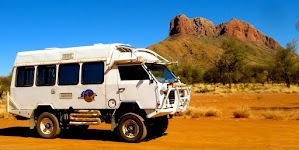 All of them offer reasonably priced camping areas in an area which is otherwise very dry and dusty country. 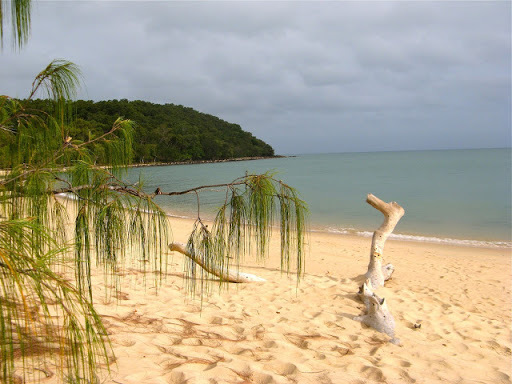 Ironically, the rain forest for which Cape York is famous, is mostly on the east coast and nearer the tip. The road doesn't run through those areas, it goes up the centre until you reach Bramwell Junction. Fruitbat Falls. It was raining. Passing through the Heath Range Nature Reserve, which is surprisingly like Tasmania, although much hotter and covered in termite mounds, we spent 2 days on the beach at at Captain Billy Landing on the east coast of Cape York. The 23 km track in took over an hour and it would have been very nice place except for the gale force wind and the tropical showers which kept blowing in. Between these however it was a very pleasant stay. Our campsite at Captain Billy Landing. 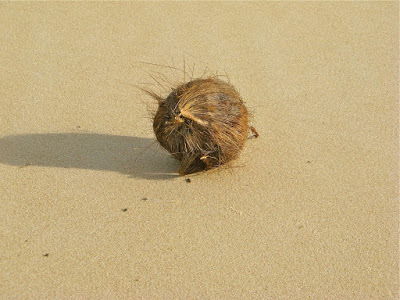 During a lull in the wind we walked the beach searching for coconuts (called Wilson) and located a smelly bat cave. 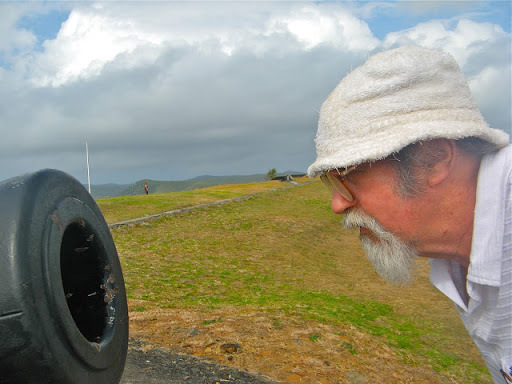 On the drive out I stopped to photograph Captain Billy Creek. 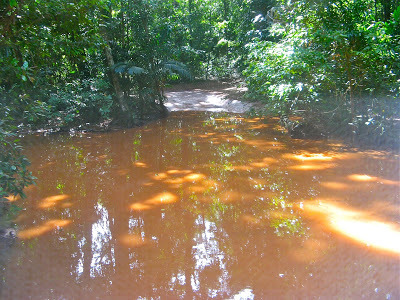 I carefully walked around the water hole in the road to avoid getting wet and put my hand on a tree trunk to steady myself. The tree trunk immediately broke into 3 pieces and crashed into the water soaking me from head to foot. I could see Janet bouncing up and down with laughter in the car but she carefully maintained a straight face after I returned just in case I was very cross, which I was. The logs which fell into the water hole and soaked me. 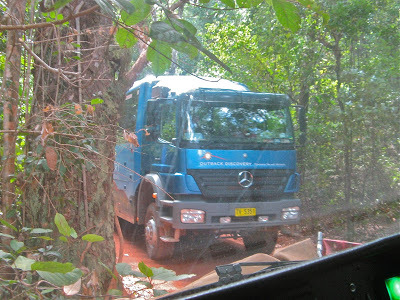 In slight rain, we drove the remaining 100 km up to the Jardine River, which, at 140m wide is only crossable by ferry run by the local indigenous people. (It used to be crossable at a ford, but no one make 10 metre snorkels any more and vehicles kept getting swept away). 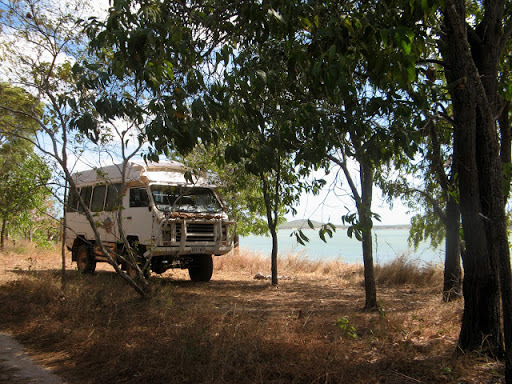 The Jardine River ferry costs $88 but covers both ways and includes unlimited camping on Injinoo lands to the north (for 3 years! ), except for established commercial resorts. It's expensive but quite a sensible way for local inhabitants to make some money for throwing open their lands to tourists. 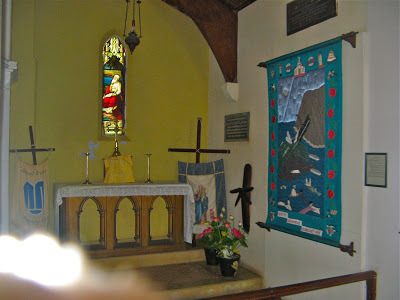 They seem very hospitable and are a mixture of islander and local people, different to those encountered elsewhere and much more accepting of visitors. 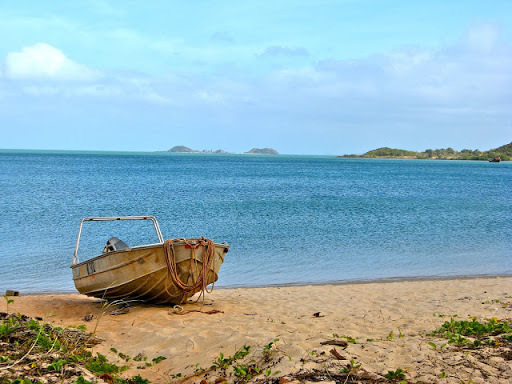 We will be taking a tour to Thursday and Horn Islands in the Torres Strait while we are here. The people of the tip are former islanders with a very laid back sense of humour and tolerance for tourists. They don't have the same close ties to the land that other mainland aboriginals have and therefore don't have scared sites or access restrictions. They don't mind where you go or where you camp, and they are also willing to talk to you as Australians not invaders or occupiers. The roads north of the Jardine however are terrible. They are only used by tourists as all the supplies to small northern towns of Bamaga, Seisia, Injinoo and Umagico come by sea from Cairns. During the Wet it would be the only way to access these locations so it makes sense. So after another 70 km from the river crossing we've made it. We've reached the very top of Australia. The car park at the tip was small and I might have parked a tad too close to this tree. We reached the very top of the continent. Later I stood behind the sign so technically I was even further north than north. 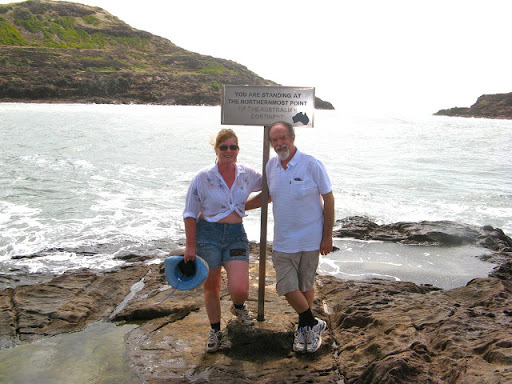 After 4400 kms, almost in a straight line north, we are at the tip of Cape York. 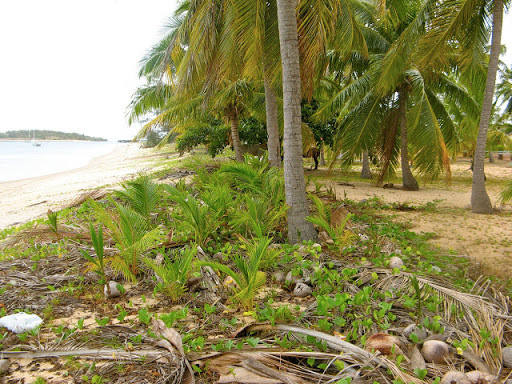 Well actually we camped at Somerset Beach opposite Albany Island last night, about 11 km east of the tip (and only 140 kms south of Papua New Guinea) with coconut trees all around us and a warm breeze blowing. But this morning we did actually walk to the tip and then camped at the most northerly campsite on the continent. The view south from the tip. In fact everything is south from here. Our campsite at the tip. We are the most northerly vehicle on the continent at this point. Note the 2 chooks. Surprisingly, we even have a Telstra NextG service here. It's been a long and sometimes arduous trip, especially the last 1000 kms from the Cairns/Cooktown area. 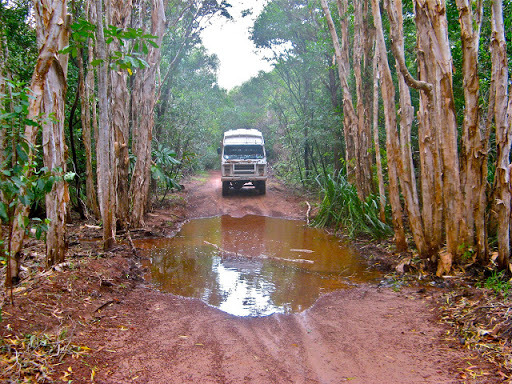 The tracks up Cape York are mostly unsealed and vary from the better-than-bitumen to the roughest ever encountered (but fortunately only a few hundred kms of this kind). Of course we then had to do it all again in reverse. It hadn't all been plain sailing though, we had a myriad of small annoying faults, mostly electrical, and it was been raining and blowing a gale for the several days. We hoped it would soon change but it it did not. And it was not as hot as we expected (mid to high 20's) although it was very humid. The 2 main problems we had were some burnt out wires in the alternator circuit which affected alternator charging, the instruments and the starter motor circuit, (this took the best part of a day to locate and repair), and the main power transistor blew in the solar panel regulator. To fix that I had to make up a circuit out of some odd electronic components to drive a relay, since I didn't have a spare power transistor. Both fixes are working well. We did hear on the bush telegraph that Julia Gillard has superseded Kevin Rudd and we wait to see if it makes any difference. It suddenly got hot and sticky there, over 30º during the day and 20 at night. No more blankets required and we had the a/c on all the time. Glorious sunshine now but a bit too hot and humid. Beautiful blue sea but we can't swim in it, very sad. But we did actually get to the Tip. And a huge tour bus, far too big for the track. We had to drag a large fallen tree off the track this morning, 30+ vehicles queued up on one side and only us on the other side. Guess which way the tree had to be dragged? 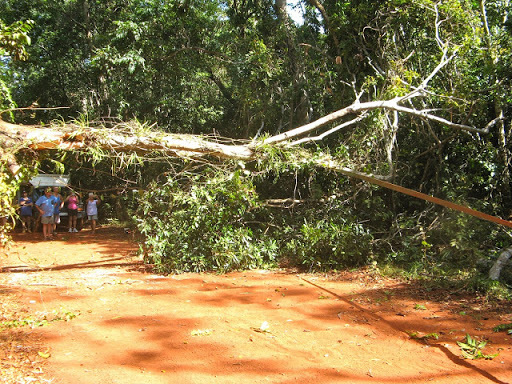 We are dragging the fallen tree off the track towards us, thus making us heroes for the day. A still from the movie "How The Oka Saved The Day". You can just see the green strap attached to the towing point. Do we like The Cape? We're not sure whether we really liked the Cape yet, there were way too many people about and it was humid. I think we like the open deserts of the west better, even with their flies and insects. On the roads on the cape there was a continual stream of 4WDs, mostly with camper trailers, and we had to drive with our headlights on all the time so we could be seen though the dust. Not pleasant driving. The other thing we missed is being able to see large vistas. Rain forest is beautiful in moderation but you can only ever see about 100 m in any direction and can rarely get a big picture view of the area, the Heathlands Reserve being an exception. 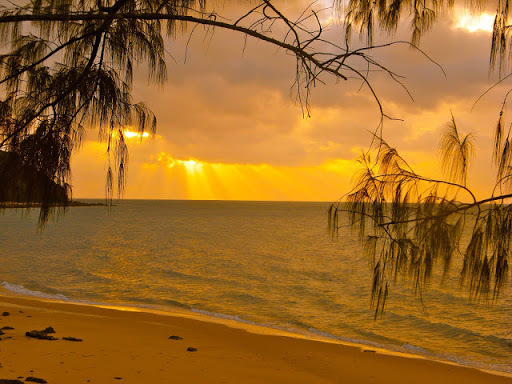 After leaving the Cairns area and heading up the long and dusty peninsular Development Road, your next view of the sea is not until you reach the tip nearly 800km away, unless you deviate to one of the east or west coast locations on the way. Well we've been to the Tip and have photos to prove it. 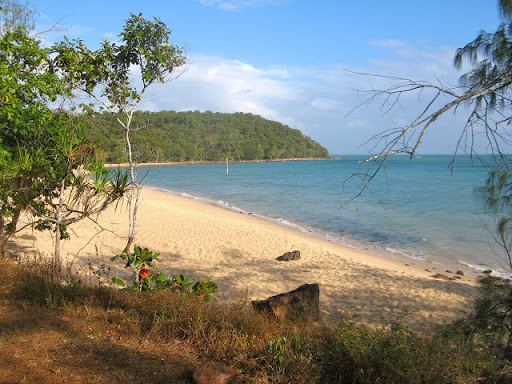 We camped near the tip for a day but there was a lot of vehicles and foot traffic to the cairn and signpost on the actual Tip, so we moved to a beach at Wroonga Point just west of the Tip. Tracks are extremely rough and there are almost no signs. Surprised to find a phone service in this very remote part of the country. The track in is a bit wobbly. We stopped to work out how to pass an oncoming vehicle. Camped at Wroonga Point, west of the Tip. The weather has been less than we had expected, extremely windy on the east coast, cloudy and showering for much of the time and we saw very few of their legendary sunsets (or sunrises for that matter, but that's a bit academic). But mostly it was insect free, which is good. The west coast is much nicer, calm, sunny and with superb seascapes. But was darn hot and humid up there. 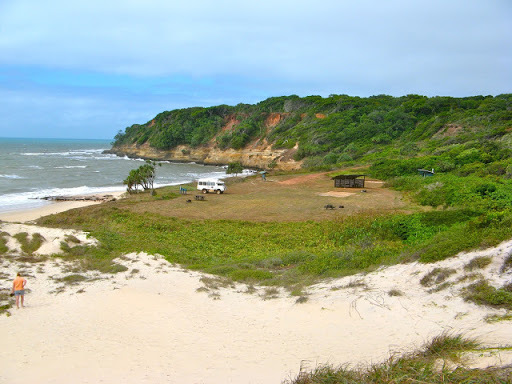 After Wroonga Point it we moved to Mutee Heads, a free camping area about 30 km SW of the tip enjoying the tropical beaches, although without swimming, of course. And surprise, there was a good NextG phone service there too, and as you can tell we have phone/modem which works fine although the data rate is slow. 1st July. A Happy New Tax Year to all you tax payers. 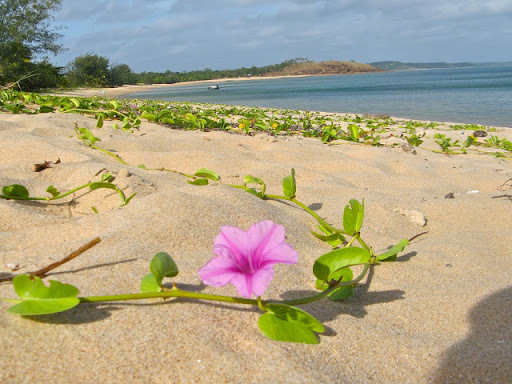 Mutee Heads is a beautiful area about 25 km southwest of Bamaga and Seisia. We had a bit of trouble with a bridge, see the photos. It didn't look strong enough for a 6 tonne OKA and some of the timbers were missing, so we forded the creek instead. You can't fall through a ford. Suspect bridge on the road to Mutee Heads. We chose to ford the creek instead. Mutee Heads was the site for a WW11 radar station on top of the cliffs. It's still there but took a bit of finding. The support frame is looking very worse for wear so if you want to see it, make it fairly soon. The people on the tip migrated from their island home of Saibai near PNG in 1947 when a king tide swamped their island and their leader wanted somewhere for them to survive and expand their culture. 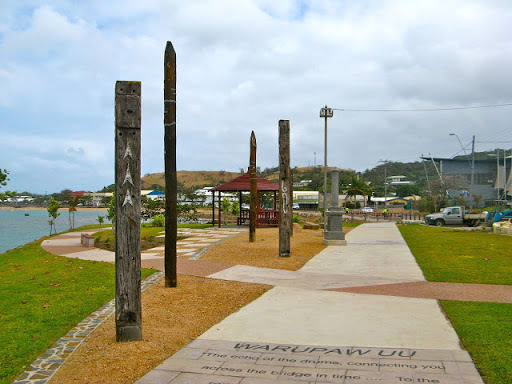 Mutee Heads was the place of their first settlement on the mainland. They were given the the buildings and facilities left by the Americans who set up a radar listening post and port here in 1943. There's nothing left of that era now, just some rusting relics and a flat landing area where we are now camped. Sunset at Mutee Heads campsite. 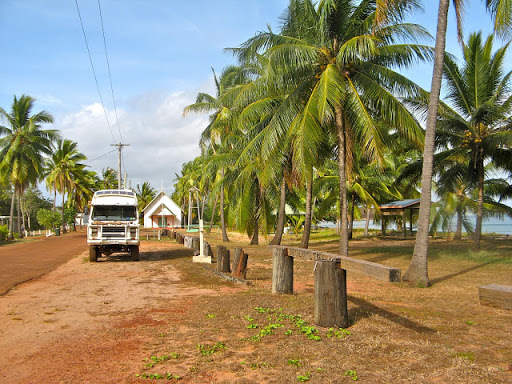 Seisia is a lovely little islander town on the coast and nearby Bamaga is a small islander town inland. They are very friendly people and nothing much happens, certainly not very fast. Peaceful scene on Seisia Beach. But up here it's hard to believe we are still in Australia and these people are Queenslanders! The supermarket was closed today for a stocktake, yesterday it was the petrol station. It doesn't seem right that they should be harassed by taxation issues. That all seems just so remote and unnecessary. 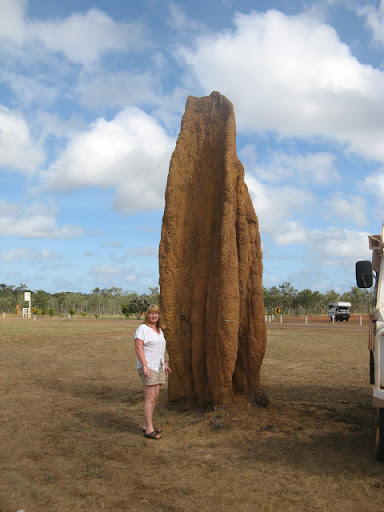 Their vision extends about as far as Cairns, 800 km away, where their supplies are shipped in from once a week. Everywhere else is just the other side of the world and we felt just the same. These lads don't know it yet, but the supermarket is closed for a stocktake. They have severe liquor limitations here. We are only allowed to possess 30 cans of beer and 2 litres of wine each. Wow. But it is expensive. But we were lucky, in the Kimberley part of WA they have a 1 litre per person restriction, and you have to have your photo id recorded. They don't even sell 2 litre casks there any more, and 4/5 litre casks are things of ancient history. It looked just like what Treasure Island should look like, a plateau to watch from, sandy bays to land on and cliffs to hide treasure in. 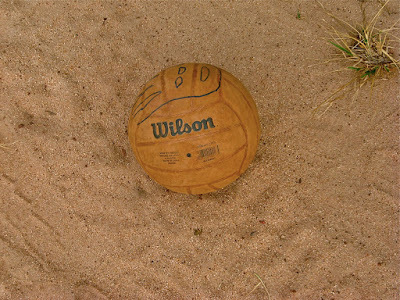 Warm and sticky again here, camped on the beach with waves gently sloshing about beside us. I wonder if crocs can see in the dark, I wouldn't mind a swim? (Only joking because I know they can. Their eyes shine red if caught in a spotlight, then they gradually submerge... Haven't seen any yet but maybe they've seen me?). 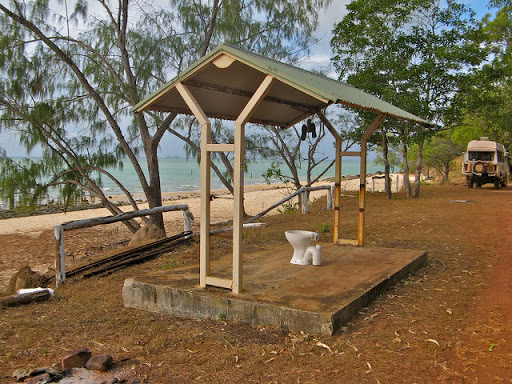 The camp grounds in Seisia, Loyalty Beach and Punsand Bay are OK although a bit basic and crowded, but we prefer bush camping and we'd paid for it anyway in our Jadrdine River crossing. However, it was school holiday time and many people said they had to stay in caravan parks so the kids had something to do. Well maybe this kind of tough adventure is not appropriate for young kids? So after looking at the map, we saw a faint track leaving south from Seisia towards the beach. Yes, it was narrow and it did past by the town rubbish tip, but we persevered and were rewarded by a sandy track which ran along the beach dunes. It was where the locals came to fish from the rocks to catch their supper. 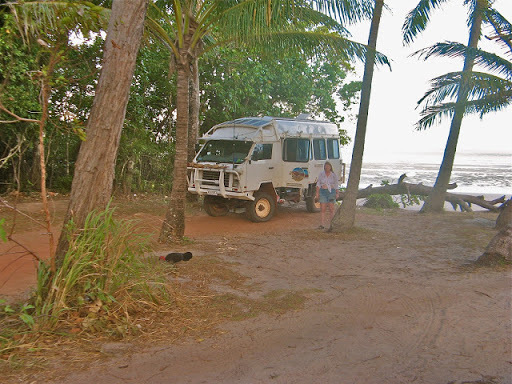 So we chatted with the locals and camped on the beach dunes for free for several days, within sight of the happy campers crammed into the expensive Seisia Holiday Park. 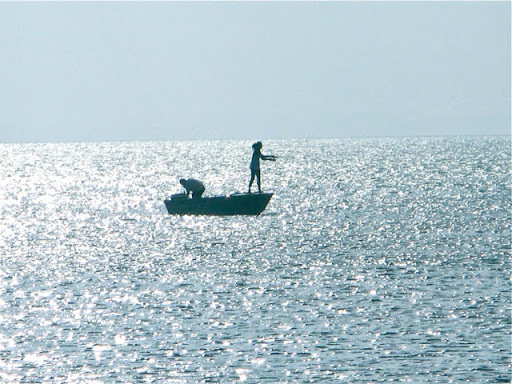 Aboriginal girl fishing from a boat. 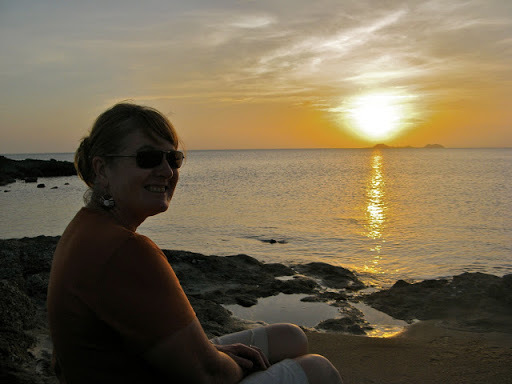 While we chatted, one ample lady fisherperson (whose opening words to us were "Bloody uncomfortable rocks!") caught a beautiful coral cod just a couple of meters from her bloody uncomfortable rock. One of the features we noted in many places that a local with a hand line and little or no bait caught fish by the ton off a rock on the beach, while southerners armed with $hundreds worth of expensive casting and reeling equipment barely caught anything. Obviously local knowledge is more effective than technology. 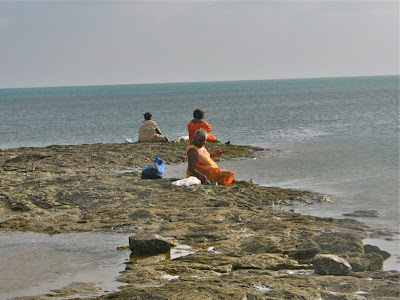 Lady fisher-persons fishing from the rocks. 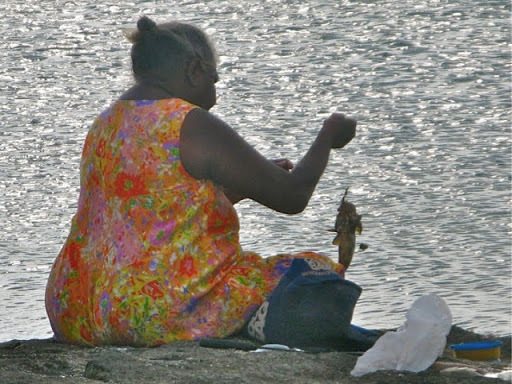 This ample fisher-person has just landed a coral cod from her "bloody uncomfortable rock". 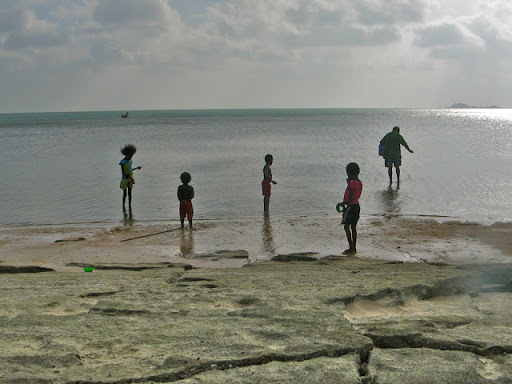 We headed across to Thursday Island (TI) for a day to see how the south sea islanders live, which was interesting. 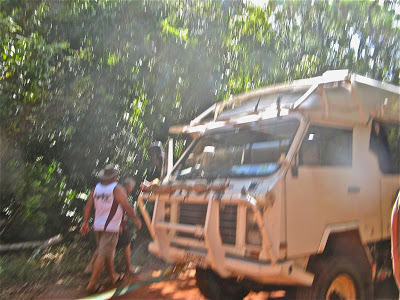 We did a trip out to Thursday Island while we on the Tip (sorry of I have already mentioned this, but our minds are working on Island time), smooth going on the way out (35km) but rough and corrugated on the return trip. I could swear the 18 m catamaran left the water one one point. Anyway we made it safely back to shore and it was an interesting day. 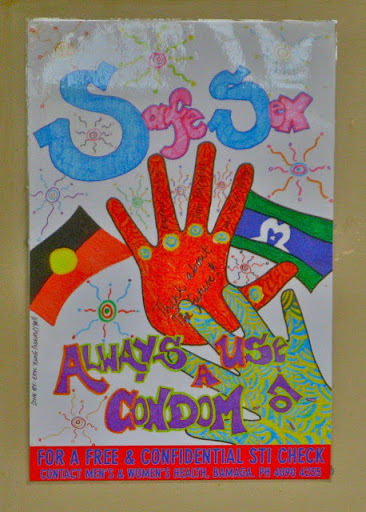 TI is peopled by a mix of Melanesians, Japanese and New Australians (do people still use that term?) and there is still a bit of ancient culture around but not as much as we had expected. Even though we are now only 140 km south of Papua New Guinea, we are still in Australia and even more weird, we are still in Queensland. Surprisingly TI had better stocked shops than many small towns on the mainland and the fuel was cheaper, but that was a bit academic. We did a bus tour of the highlights (19th century forts, museums etc), had lunch, a wander around (it's only 4.3 sq km) and Janet bought some earrings, as usual, and then we caught the ferry back to Seisia. I still have the injury scars of the Green Fort trip. The fort is built on a pile of rocks and I tilted a large flat one up with my right foot and then kicked it with my left toe, which hurt and bled a bit, but not enough to get any sympathy. They have a special Frangipani on TI with beautiful red flowers but no aroma. They call it "Paris Hilton" since it looks good but has no scents. There are also Tuesday, Wednesday and Friday Islands nearby, but no Saturday, Sunday or Monday Islands since apparently they like their long weekends too much. 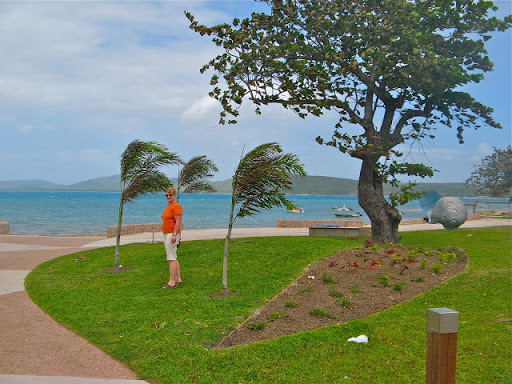 Close to the equator but still in Queensland? 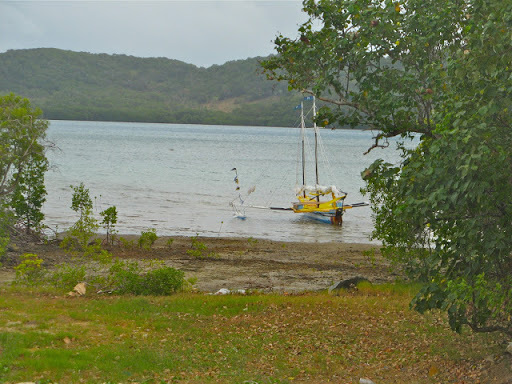 On Thursday Island, at 10º 34' south, we are at our most northerly point on this trip, and only 140 km south of the PNG mainland. 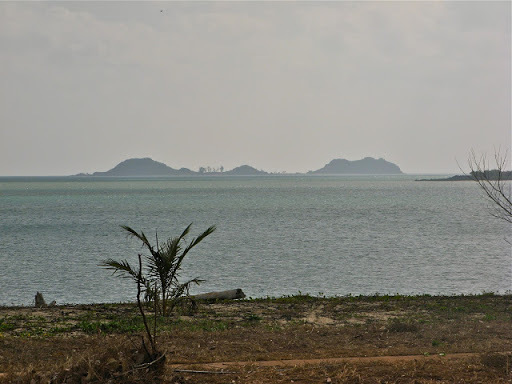 The islands between the Cape and PNG have special border arrangements which allow islanders to visit one another on a daily basis for purposes of trade. The border between Australia and PNG runs along a sandbar in the Timor Sea, although many Australian Islands are actually north of that line. 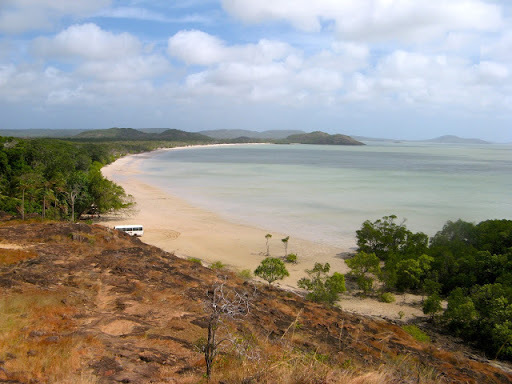 In fact Saibai Island where most of the Cape residents came from is only 3 km off the PNG coast but, strangely, it's still part of Queensland.